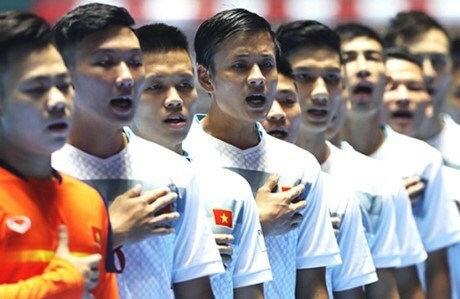 Hanoi (VNA) - Coach Miguel Rodrigo has named 17 players for the national team, who will train for the Southeast Asian Games in Malaysia next month. The Spaniard has pinned his hopes on veteran players who competed in the Colombian World Cup last year, such as goalkeeper Ngo Dinh Thuan, pivots and defenders Quoc Nam, Xuan Du, Trong Luan and Van Vu, together with some freshmen, such as Ho Van Y and Vu Duc Tung. Rodrigo said he may include some more names next month after Vietnam’s Thai Son Nam and Sanna Khanh Hoa finish their tournament at the Asian and ASEAN Futsal Clubs Championships. The team members will gather today and start training tomorrow in Ho Chi Minh City. They will move to Thailand for a one-week training course, where they will play three friendly matches with Chonburi on July 11, Thai Port on July 13 and Bangkok BTS three days later.